Fresh and clean on the nose with mint and a flowery (heather?) touch. Sweet with dried fruits - apricots and pears in particular. Hints of smoke in the background with a slightly peppery note. Malty sweet on the palate, accompanied by vanilla, orange marmalade and liquorice. Slightly smoky with a warming mix of pepper, oak and a whiff of cardamom towards the finish. The finish is long and creamy sweet with malted barley. Becomes drier on the tail with pepper, oak spice and a hint of peat smoke. Fresh and slightly sweet on the nose when a few drops of water are added. Increased notes of liquorice and damped wood in the back. Bold and intense on the palate with sweet malted barley, orange marmalade and an increasing warming spiciness of pepper, oak and nutmeg. The finish is of medium-length, sweet, warm and slightly spicy. Very nice! 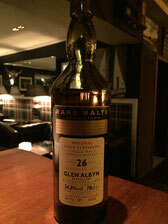 An old but surprisingly fresh dram of the demolished Glen Albyn distillery. Very attractive and well balanced with sweet fruit, malted barley, spice and a little smoke. A splash of water clearly enhances the pleasant mix of flavours of this single malt. A sophisticated whisky from the past.